Histograms are not widely understood, but taking a few moments to learn about them can improve your photography significantly. Histograms can show you immediately whether your images are overexposed, underexposed, or just right, and help you to make any necessary changes when re-shooting a scene. 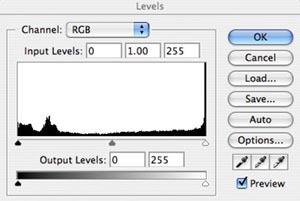 Most current Digital SLRs have the ability to preview images on the screen, but the preview screen itself is not particularly high resolution or necessarily correctly set up to show the full range of tones in an image, however many top of the range cameras also have the ability to display image information as a histogram. 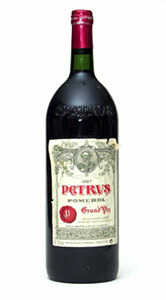 Which is (as long as you know how to interpret the information) a far better way to judge the image exposure. You can also use histograms in Photoshop, and correct for some common imaging problems. The Histogram is rather like a bar chart (you remember drawing those at school don’t you, if not maybe you recall colouring them in for someone else who did their homework) There are two axes, the horizontal axis indicates the tonal range, from black on the left, to white on the right, the vertical axis is the number of pixels. For most pictures you would expect to have a wide range of tones from black to white at the extremes with most tones in the middle. The horizontal axis represents the range of brightness from 0 (shadows) on the left to 255 (highlights) on the right. Think of it as a line with 256 spaces on which to stack pixels of the same brightness. 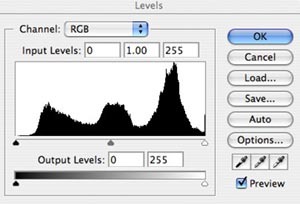 Since these are the only values that can be captured by the camera, the horizontal line also represents the camera’s maximum potential dynamic range. The vertical axis represents the number of pixels that have each one of the 256 brightness values. The higher the line coming up from the horizontal axis, the more pixels there are at that level of brightness. 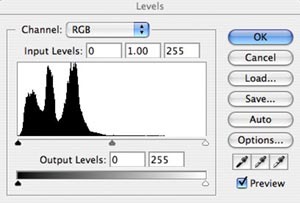 To read the histogram, you look at the distribution of pixels. An image that uses the entire dynamic range of the camera will have a reasonable number of pixels at every level of brightness. An image that has low contrast will have the pixels clumped together and have a narrower dynamic range. In the real world the image sensor has a dynamic range of around five stops, and the object of getting the correct exposure is to put the mid-tones in the middle of the range, that the sensor can record. The range is 256 separate increments of brightness from 0 (black) to 255 (white). With the 18% grey around the 128 mark (You will often hear photographers referring to the grey card, which is a tool to assist in metering). Too close to the bottom of the range and the image will lack detail, too close to the top of the scale and the image will be burnt out and unusable.< There is no such thing as the perfect exposure, because subject and lighting is always different, however being able to read and understand the histogram function on the back of your preview screen will help you to see how usable an image is. I have, further down the page, included some under and over exposed images and their appropriate histograms. 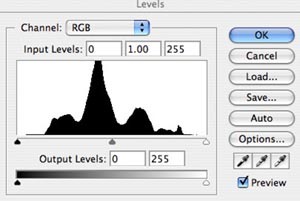 One reason to check a histogram is to see if there is enough detail in the shadow, midtone, and highlight areas. If there is enough detail, even if the image is somewhat off, it can be corrected in Photoshop using the Levels command This control allow you to adjust the shadow, mid, and highlight areas independently without affecting the other areas. This lets you lighten or darken selected areas of your images without loosing too much detail. 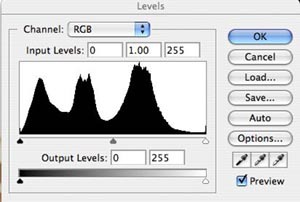 From the histogram you can determine the image’s darkest shadow and brightest highlights; called the black point and white point. In fact, it’s the range between these two points that defines the dynamic range (also called the tonal range, or contrast) of the image. 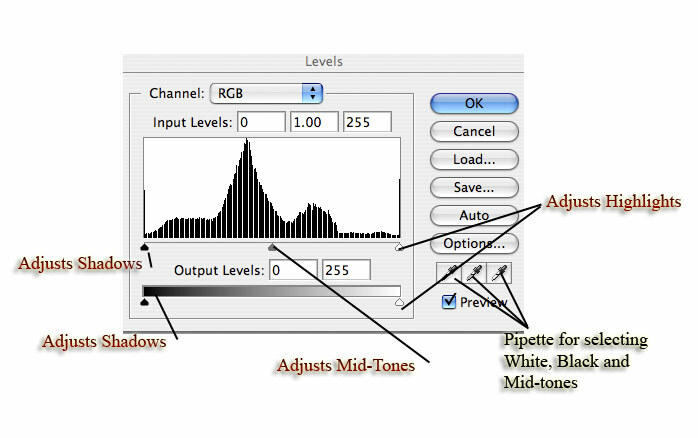 As we can see from the Histogram the image contains everything from black (small spike on the far left), through to white (on the far right) and there are a wide range of mid tones through out the remainder of the scale. If anything the image could do with a little more than the indicated meter reading. 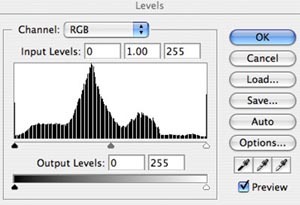 The histogram shows that this image again contains black through to white, however the most noticeable difference for this histogram is the very low amount of mid tones. 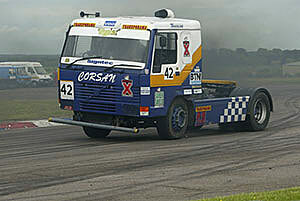 Here I have adjusted the white point of the image, to give it the required full range of tones from black to white. 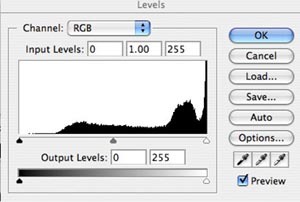 Having adjusted the tonal range of the image, the next time we open the levels function in Photoshop, you will notice that there are a few blank areas in the chart, this is because we have stretched the original tones to cover a wider range, as we can’t invent new tones ,or pixels, so there are gaps. This one of the arguments for getting the exposure spot on in the camera. If this image lacked tonal range because of exposure, we would be degrading the image substantially, (we are still reducing the quality of the image, but due to the subject matter rather than exposure. 2 stops underexposed, and you can see the histogram is all bunched up on the extreme left, which shows that there is no mid-range or highlights in the image. and as we know it is pretty much an average scene, then it is under exposed. It may be salvageable, but it will have a lot of image noise. This image is +1 stop over the indicated meter reading, and is pretty much spot on, good vibrant colours, and a wide tonal range. Here you can see that the sensor cannot cope with 3 stops of over exposure, the highlights have completely blown and many of the mid tones are burnt out. The histogram shows that there is very little data left, with a huge spike off the scale at the right hand side of the chart. 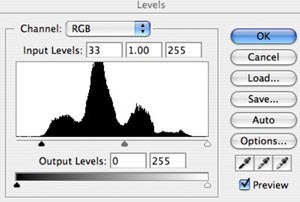 An explanation of the Histogram and the associated tools that are shown. Dragging the left (black) triangle to the right darkens the shadows. Dragging the right (white ) triangle to the left lightens the shadows. The two dragable triangles below the Output Levels greyscale bar also adjust the image, having almost the opposite affect of the triangles above. Dragging the left (black) triangle to the right lightens the shadows. In conclusion the perfect digital exposure is as far to the right as possible, but not so far that there is a chance of blown out highlights. The overall shape of the histogram does not matter at all as it merely reflects the tonal distribution of the scene you photographed.